Welcome to this month's Cup of Bead Soup! (click here to see the beads I was sent for this month). My first piece of jewelry made with beads sent from Libby Leuchtman is a long, long necklace -- very bohemian, but very chic, too, in-my-not-so-humble-opinion. I say that because this is one of those pieces that flowed from mind to bead to wire to chain to finished, like a stream flows to river to ocean. What all that nonsense means is once I figured out the focal, the rest of the necklace figured itself out quickly and easily and I felt like my mind just took over my fingers. Which was a pretty wild feeling! 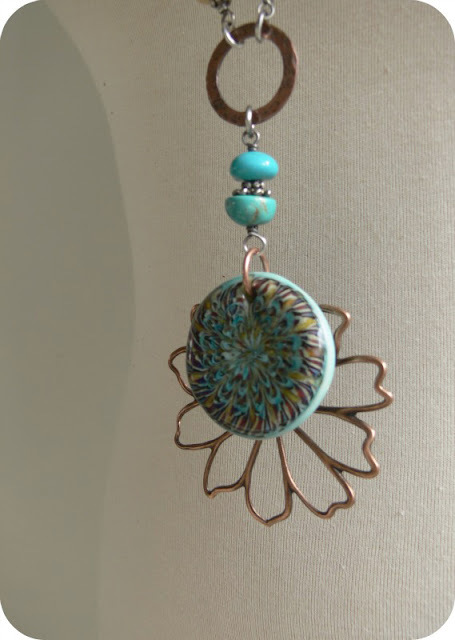 I backed Libby's 1.25" handmade glass pendant with a copper flower from Ornamentea. I used the turquoise, bone rondelles, Czech pumpkin beads, the unique patterned glass beads, and two of the sterling silver beads throughout the necklace. From my own stash, I added copper washers that I hammered and patinated, used sterling silver wire and jump rings, and triple lengths of copper chain (also from Ornamentea). The result? 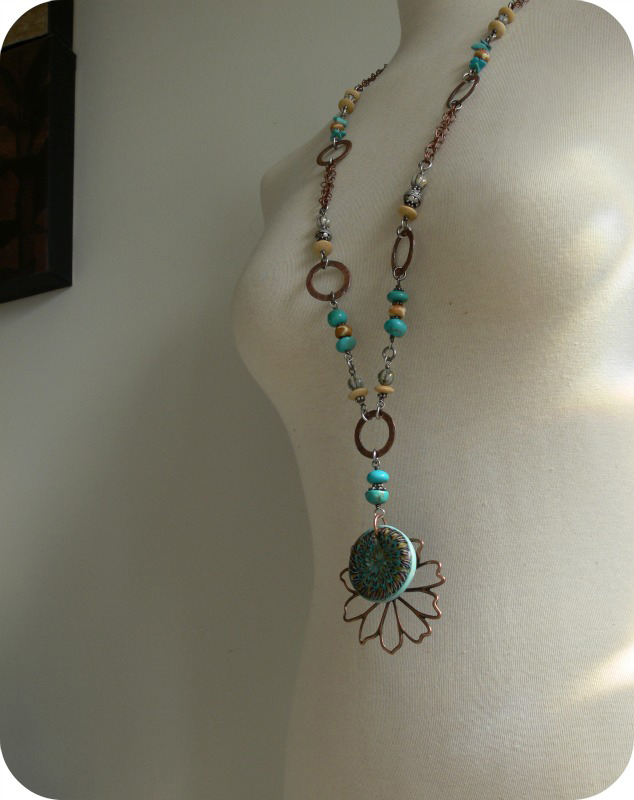 A long, dramatic, but not overpowering necklace -- my rendition of "flower power". ... which looks completely fine to me, but when working with open wire pieces like this, it's always a good idea to stop and hold the focal up to see how things will REALLY look when the necklace hangs before putting all your time into the rest of the necklace design. I am in LOVE with this necklace, and I'm keeping it. I rarely keep anything I make, but this one, I'm keeping. In fact, I wore it today, and I can tell you that even though the necklace is quite long, the flower pendant didn't flip back and forth very much at all. And that's my Sage Advice Point #2 -- if in doubt, wear it out. Wear something once if you have the slightest nagging doubt about how something will wear, lie, or roll around. I'm looking forward to creating with the rest of the beads Libby sent -- stay tuned! (PS -- If you missed my article about being an entrepreneur -- the stay-at-home version, just click here). Oh Lori I would keep that one too. How you put it all together is a mystery to me but it is STUNNING! What a great cup of soup and you cooked it to perfection! Wow that necklace tells a story. I am pretty sure you'll get people wanting to buy it off you. But then you probably always do. I love it! This is just gorgeous! Love the colors and all the elements! Now I am sing that song too! I would keep it, too! It's amazing. Your talent makes what I do look so elementary! Wonderful....I love this necklace! I'm so very much into long necklaces like this. I was even forbidden to wear my "Gypsy" jewelry to my son's wedding last June(by him). Everything is just perfect, the color, flower, length and metal choices. It Rocks! What a beautiful piece. You'll be getting lots of compliments that is for sure. I have to agree with your comment about wearing and trying out a new piece. You sometimes need to give a piece a test run. Golly Miss Molly, that is a beautiful focal and you have set it off in a wonderful way. That advice of hanging it up and wearing it out is a good one. Would you buy a car without a test drive? And, you'd spend a lot more money on a car. So why not treat jewelry in the same way? I like to know that jewelry is going to work. I would wear this too! This is beautiful, I love how you paired the flower with the glass pendant. I would love to wear this necklace. I have been thinking about pairing copper and silver in my bead soup piece and you have just inspired me that little bit more. Wow - gorgeous - I adore the colors of this piece!!! Fabulous necklace Lori! It totally flows and the colors are my favorite...this necklace has tons of fabulous elements and a great design. This is really gorgeous and I don't blame you for keeping.....I would too! Lori, that is beautiful! I don't blame you for keeping the necklace! I tend to wear my jewelry, especially, if it's a gift, before I give it away. When I say wear it, I will wear it for a couple of days before giving it away. It's good to get the feedback, especially, if the receiver sees it and likes it. I don't blame you a bit about keeping it...I would too! This is a gorgeous piece...beautiful work! your design is wonderful and the colors are my favorites...copper is my new gold. I collect everything in copper!!! I really love the long style. I love it when a project flows naturally. It's a lovely piece. A beautiful piece of flower power! Very lovely, Lori! 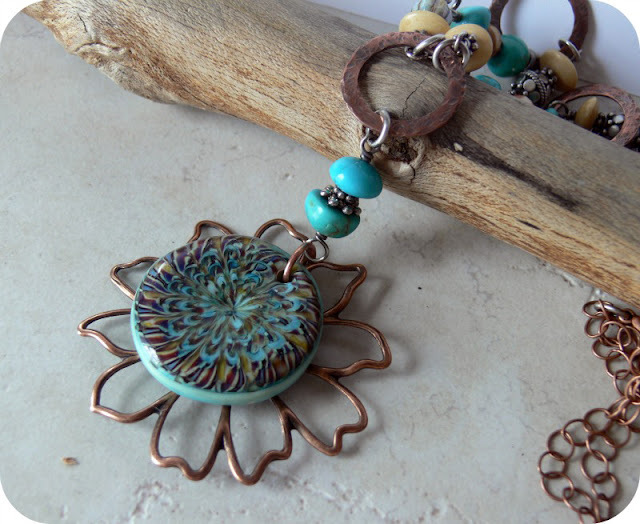 Wow, Lori, what a great idea to make the beautiful bead even more "flowery" by layering it with the flower!!! I love the colours and the length of the necklace, too. That's summer!!! Yay! Lori the necklace is stunning! I love how you incorporated the large focal bead and the copper flower! You are correct the necklace is a keeper! Absolutely gorgeous!! Great work, Lori! Beautiful Lori! I can certainly see why you are keeping it, that glass focal is gorgeous! How's the camera work coming? I still haven't done anything for the class, think I might just miss this one, too much else tying up my time. Really beautiful piece. It is fun when it "just happens". Very chic! I love those colors lately. I was never a blue fan but the more I see it the more I love it. Is similar to what I made for the soup!! Just beautiful, I love that color blue lately. It's similar to what I made for the soup. 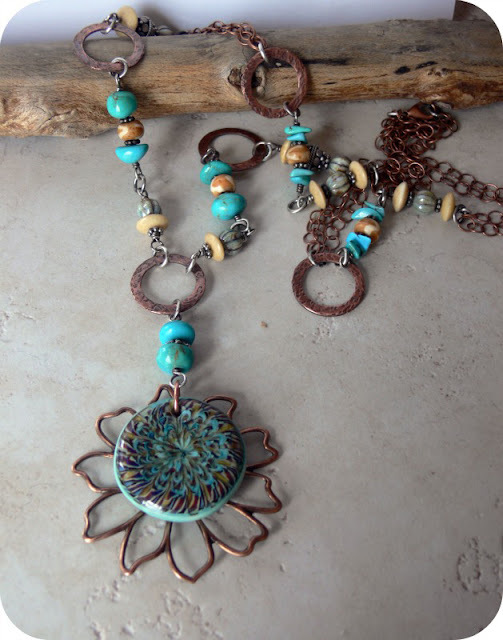 Beautiful work by Libby on the beads and a gorgeous design by you, Lori! It has such a wonderful earthy feel. Something you need to wear on a beach walk on a sunny day! Gorgeous! I love long necklaces! How stunning! I'm a sucker for turquoise. You have such an eye for color. That IS a keeper, Lori! When I saw "Bohemian" in your description, you had my attention! A wonderful flowing piece, as you said. Isn't it great (and too rare) when you pick a starting point and then it just stays in motion? !